Is your dog scared of the noises that make up the soundtrack of everyday life in the city? Does he find it tough to cope with the sound of sirens, beeps, shouts and engine sounds? While this problem is most often an issue for dogs that live in busy urban environments, all dogs can and should benefit from this treatment since a dog’s location might change, suddenly exposing them to the noise triggers commonly associated with city life. 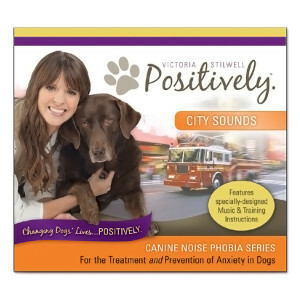 This groundbreaking desensitization tool will teach your dog to associate positive feelings with city sounds rather than feeling fearful, and will help to gradually reduce your dog’s fear when exposed to such situations. When used properly and implemented in conjunction with the enclosed behavioral modification protocols, you have an excellent chance of rehabilitating your urban sound-phobic dog. The dog first learns to associate positive feelings with the music on the CD. Once he is calm and relaxed, urban sound effect noises are slowly introduced alongside the music at gradually increasing levels while the owner continues to provide positive experiences. Eventually, the dog is able to function normally in even the most frenetic city environments. To learn more visit www.CanineNoisePhobia.com. Dogs that have a fear of noises commonly experienced in cities often go on to develop a full blown phobia that becomes deeply ingrained and highly resistant to change. Dogs of a more sensitive nature or those that suffer with other anxieties are more likely to develop a fear or phobia, and whether this is triggered by a single traumatic episode or prolonged exposure, the result is often distressing for dogs and their people. Without extensive behavioral therapy and management strategies, fears and phobias will become chronic and severely impact a dog’s ability to cope when life in the city.